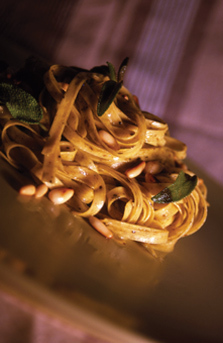 Ingredients: 250g Fettuccine with sage, 30g butter, 50g fresh sage, 50g walnuts, salt and pepper. Preparation: Put walnuts in a non-stick pan and let them slowly toast for 2 minutes, stirring constantly with a wooden spoon. Melt some butter with the toasted walnuts. Wash, dry and chop the sage, then add it to the leftover butter, which you have heated (but not fried) before. 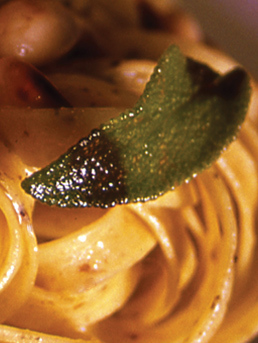 Cook Fettuccine with sage in boiling salted water; drain them "al dente". Add the sage-flavoured butter, walnuts and season with pepper, then serve.